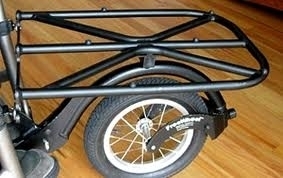 It quickly Mounts to the top of your Freewheel and gives you room to store luggage, carry groceries and so much more. Great for kids and adults. 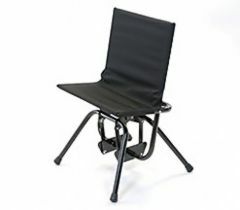 The FreeWheel works by quickly and securely clamps to the solid footrest of your rigid-frame manual chair. 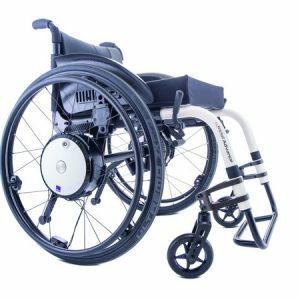 Once attached, the FreeWheel gently lifts your front casters off the ground turning you into a 3-wheel, all-terrain chair. 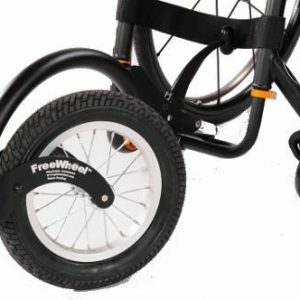 With the FreeWheel you can safely push over surfaces that would typically be impossible! Instead of struggling or popping “wheelies” to go over grass, curbs, or down dirt trails, you can now safely push over almost any obstacle. 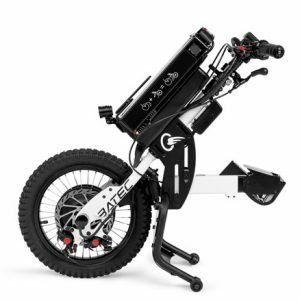 Not only does the FreeWheel make it easier to push yourself, it makes it easier for anyone who is pushing you and you’ll feel much more secure being pushed. The FreeWheel comes with all you need to set it up on your chair. The initial installation may take approximately 15 min., after that the FreeWheel clamps on in seconds. When you are not using the FreeWheel you can store it on the perch on the back of your chair.